Hex Chests Remastered is the latest Kickstarter from Elderwood Academy. 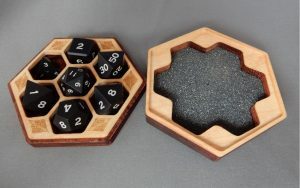 “Hex Chests” are small dice boxes with individual “cells” for each die. Here is a shot of the exterior with a standard 20 mm die for scale. 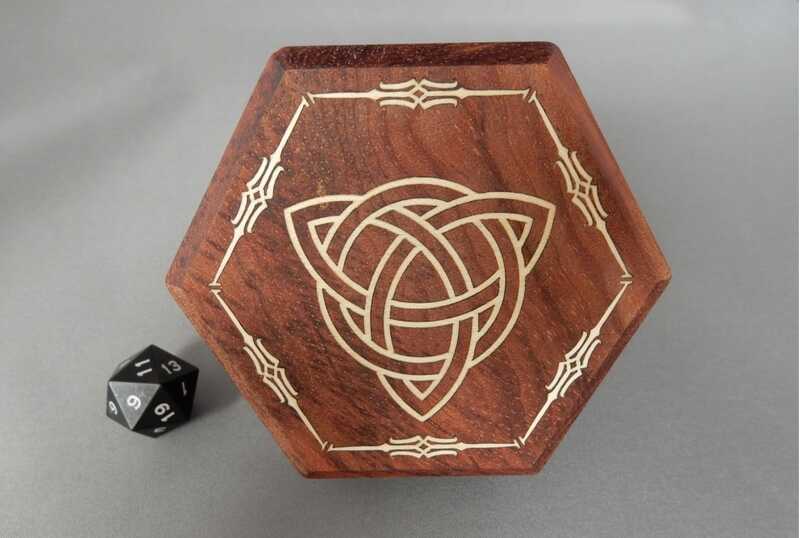 This is a Bubinga wood version with a Celtic Triangle yellow inlay. The box is 3.5 inches (9 cm) from each point of the hexagon to the opposite corner. It stands 1.20 inches (3 cm) tall with the lid on. I lack the camera equipment to get the shot, but I wanted to make it clear that the image on this Hex Chests Remastered box is not painted, it is an inlay. Elderwood cut the design into the top of the chest and then filled it with another type of wood. Besides removing paint issues and guaranteeing the art will not fade, it is an elegant and precise bit of woodworking. The lid uses magnets to hold it in place and a small interior ledge prevents the box from twisting off. The only way to open it is to pull directly on the lid. Here is a shot of the open Hex Chest. There are seven honeycomb cells that fit my standard set of role-playing game dice very nicely. The foam in the lid is .25 inch (5 mm) thick and is held in place with a pressure fit. I did a “rattle” test and my beautiful, but somewhat scratchable aluminum dice did not make a sound. You can easily remove the foam to replace it or use the lid as a dice tray. I would also direct your attention to the magnets that hold the box closed. Oh, sorry, you cannot see them because they are underneath the lighter, decorative wood on both halves of the box. I checked with a steel ruler that magnets are on both sides of the box and correctly oriented so they grab quite well. I am very pleased with the hidden magnets as many other dice boxes have the metal exposed and it detracts from the overall look. This is amazing craftsmanship and I am nothing but impressed with the Hex Chest. It is one of the most elegant game accessories ever to cross my review table. 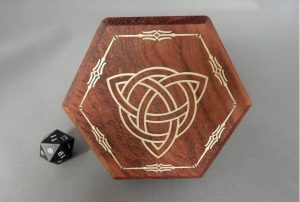 If you are interested in this item, I highly suggest you check out the Hex Chests Remastered Kickstarter currently running. There is a multitude of options for art, materials (even an Ikea do-it-yourself version) and designs available. They are even selling a gizmo to make your dice float above the table! Update: The Kickstarter exceeded its goals and will fund!